Today I just wanted to share a quick and amazing bread mix that we've been working on here in the test kitchen that has been a great "grab-n-bake" mix. It is "no-brainer-bread" at its finest. 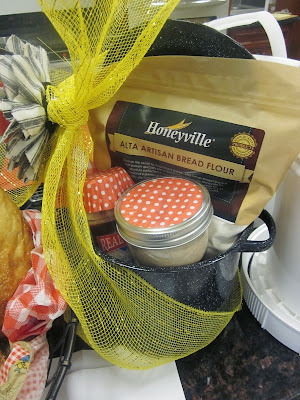 It is my basic 4 Ingredient No-Knead Bread made simple fast. Follow the baking instructions using a pot to bake it in, and you'll have great success in having a very crunchy, chewy, amazing crust! 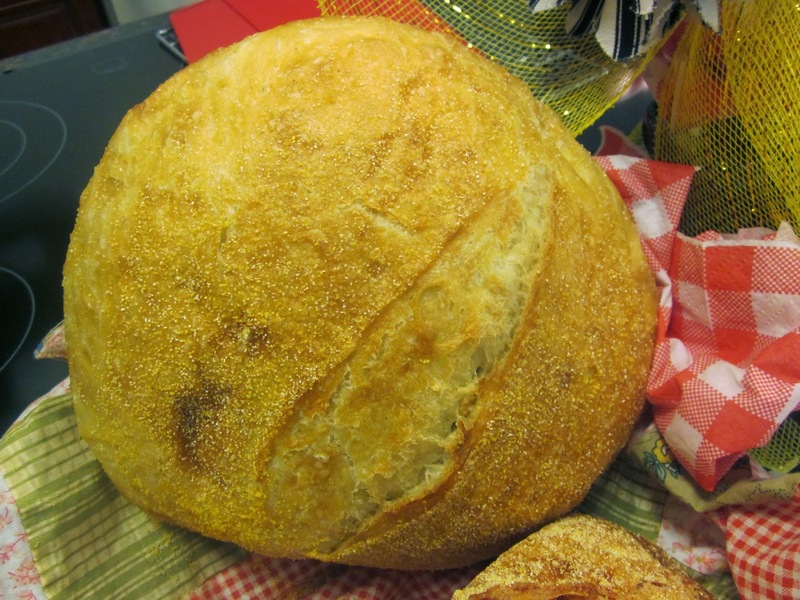 The secret is the use of a remarkable Artisan Bread Flour . The one I use has the added benefit of malted barley flour and ascorbic acid, which help with the yeast action and the dough development. This year, I plan on giving this bread mix away with gallon sized pots and little cute bottles of pink kosher sea salt (to sprinkle on top of the loaf just before baking). The yeast is included in the mix, which means it is only shelf-stable about a year, but what a great year it will be! Directions: Combine the ingredients with 1 ¼ cup water in a 1 gallon food-grade bucket or a large 1 gallon bowl with a lid, just until everything is mixed and smooth. It takes about 20-30 turns by hand to get it all combined. 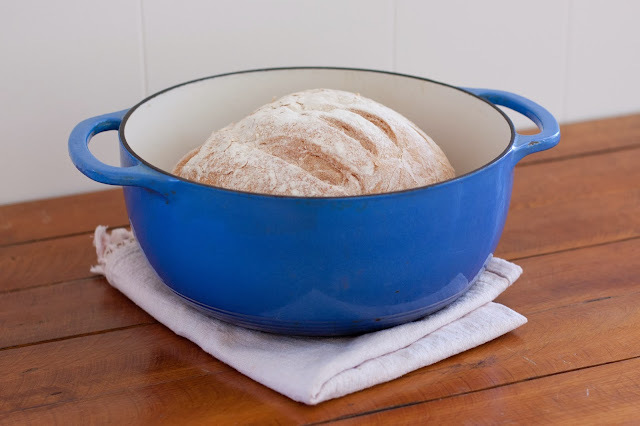 Cover with a lid and keep it covered 10-12 hours at room temperature until you're ready to your bake bread. 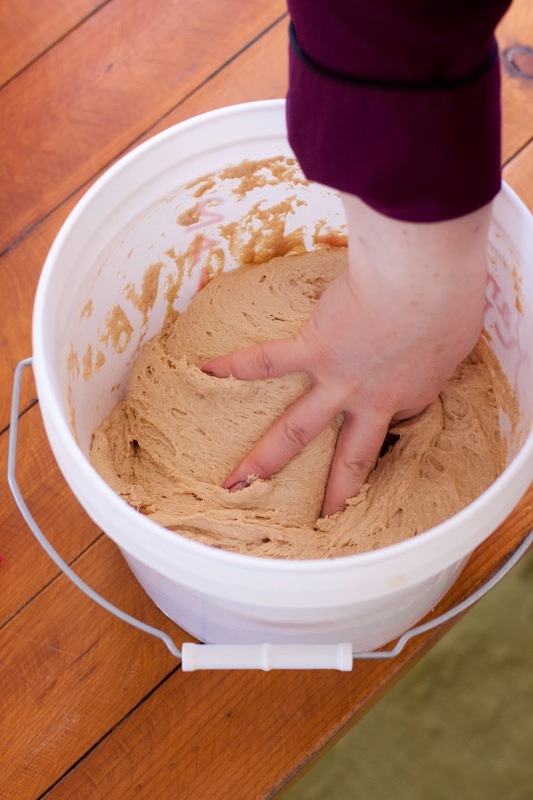 Form into a tight ball of dough. Place ball in a well greased gallon sized Dutch oven with a lid or a gallon sized covered oven-proof stock-pot/ pan. Allow to raise until triple in size, about 2 hours (or 1 ½ hours in a lightly warmed oven no hotter than 110°). Preheat convection oven to 425° (regular oven 450°).. Lightly slash the tops of the loaves with a sharp serrated knife. Sprinkle with salt if desired. Bake at 425° for 25 30 minutes. visit the post on my 4 Ingredient No-Knead Bread! Xoxo!! Another way to do a bread kit is to just give the recipe and smaller packages of the ingredients. No matter how folks get their bread supplies, they'll be excited! Ironically, this time it will be the same for Utah, just be sure that the room temperature that the bread is raising is 75 degrees. In the winter it may take longer, since I know that a lot of folks don't keep it that warm. For the final raise on the loaf, heat your oven to 100 degrees (put it on warm, let it heat 2-3 minutes and then turn off the oven). Place the raising loaf, covered in the gallon pot, in the oven to raise. Then, when ready to bake, take loaf pan out of the oven. Bring to the high temp and bake. Xoxo!